Tomorrow is the first day of October, and the beginning of my favorite time of the year! I love seeing fall roll around. Know why? I love holidays, family traditions, and the fun of celebrating with my family. When October rolls around I know that I have two kids with birthdays that we will be celebrating, Halloween, Thanksgiving, my husband’s birthday, my brother’s birthday, Christmas, and then New Years. All that holiday fun is rolled up in three months of busyness that I absolutely love. 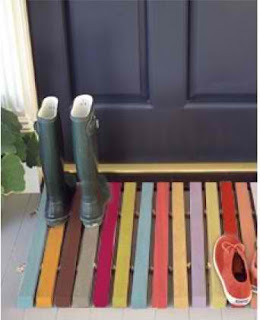 The other night I was cruising Pinterest (I am a total addict by the way) when I came across this wooden doormat from Martha Stewart Living. I was in LOVE and had to make one for myself, however I didn't have any rope on hand so I decided to make one using what I had on hand. I decided to stick with white for mine since my furniture on the front porch is white. So I headed to our scrap wood pile to find some boards and get started. We don't throw any wood away you never know when you will need it! First, I measured the width of my front door to determine how wide I wanted my doormat. I ended up making mine 42" wide. I cut three bottom runners that were each 42" long and cut twelve runners that were each 18" long. I screwed each of the 18" top runners to the three bottom runners. I put the screws in from the bottom of the mat so that the screws would not show. Sunday night I wanted something sweet to eat. I didn't want Brownies or anything chocolate, and I was tired so I needed something that was easy to make without too much work. After much thought I decided on Blondies. I know there are a ton of Blondie recipes out there, and mine is nothing spectacular or out of the ordinary but I like it, it's simple. Sometimes there is a lot to be said over simplicity. 1. Preheat oven to 375 degrees and grease a glass 9x13 cake pan. 2. Melt butter or margarine in the microwave. Mix melted butter with the brown sugar and sit aside. 3. In another bowl mix together the flour, baking soda and salt. 4. Beat the eggs and vanilla into the brown sugar/butter mixture. Add the flour mixture in a little bit at a time. 5. Stir the chips in. 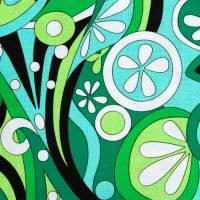 Flirty Aprons is having a Flash Sale and is offering two of their aprons for 50% off. This is a great deal on these aprons, as it makes them just $12.97 each! 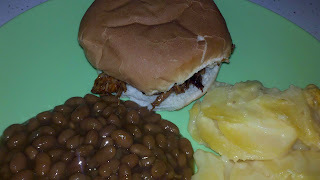 I have realized that I post links to a lot of new recipes each week that I will be using in my weekly menu plan but I never come back to tell how I like the recipe when I try it. A couple of weeks ago I tried this Honey Thyme Chops recipe from Kayotic Kitchen and it was just too good not to review. My kids, who can be extremely picky, even loved this recipe. The pork chops are just sweet enough without being too sweet, and have gained a spot on our family favorite recipe list. When I made them I didn't have any orange juice at home, I had put it on my grocery list, and still managed not to get it. 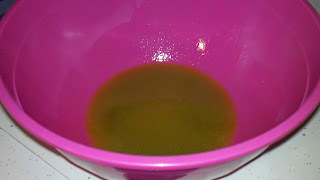 So I used lemon juice (which the recipe suggests as a substitution) instead of the orange juice. I also did not have fresh thyme at home so I used some thyme from the spice cabinet and it worked out fine. 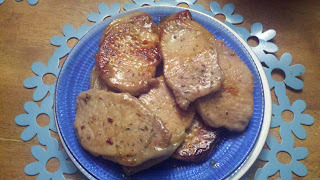 I cooked ten pork chops so I doubled the recipe, and cooked them on my electric skillet. I mentioned last week I was thinking about picking up some PRN work to bring in some extra money over the holiday season. Last April I left my full time job to stay at home with my kids. The work schedule was overwhelming, my husband's (who was in a car wreck in April, 2008 which left him disabled) health was going down hill from the extra work he was doing to pick up my slack, the kid's were missing me, and nothing was getting done around the house. We have said time and time again that money isn't everything, and that we would rather sacrfice some of the nicer things in life to have me at home with the kids. We feel this is important, and I had been a stay-at-home mom up until my husband's wreck. We could pay our bills without my income, and I knew that I could pick up some of my freelance writing jobs as well to bring in a little money (and I do mean LITTLE). As a former homeschooler, who is still a homeschooler at heart, I am always looking for educational opportunities for my kids. I was on mamasource (great deals website by the way, be sure to check it out) and found a great deal on a three month Little Passports subscription. Little Passports is designed for children ages five to ten. Each month your child will receive a package that includes letters from the fictional characters Sam and Sofia, along with souveniers and gifts from a different country each month. It is a great fun way to introduce your kids to the world around us, and makes for a very fun way to learn geography. Anyways, back to the mamasource deal - you get a three month subscription, which is normally $54 for just $26. Plus if you use the code "SEPT15" you can save 15% on your first order from mamasource. I ordered my kids a subscription, I can't wait to get our first package! You can check out the deal here. I can't believe it! 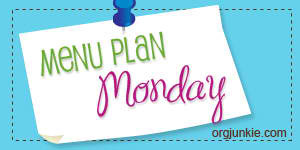 Here it is Friday night and I am writing my Menu Plan Monday post out! That is two weeks in a row now! It feels as if I am finally falling into a groove with our schedule and it is so nice! As I say every week, we are busy, busy this week. We will actually be adding dance classes to our current bundle of extra curricular activities this week. We will already be in town for Little Man's soccer practice, so this will just extend our time in town by an hour. As my husband and children sleep in their beds, I am up. Catching up on blogging, emails, and trying to get some work done. I love when the house is quiet like this. I don't get the chance to enjoy it that often, especially during the school week. I am constantly running taking the kids to school, running back and forth to after school activities, and making sure that everyone is exactly where they need to be exactly when they need to be there. It wears me down and I often find mysefl wishing I wasn't so busy. I will find myself wishing for the day when I don't have to do all this running, and then I realize I will miss this. This time that I have now is so precious, my kids won't always be this age, and when they are grown I will long for these days back. I really need to just sit back and enjoy the time I have now. Even though I am busy, I am blessed to have this time. 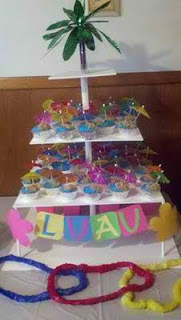 A few weeks ago for Sunshine's Luau Themed birthday party I was on a major time crunch so I needed something easy, easy, easy. Both these Sandy Beach Cupcakes and the Sunshine Cake were that! I made the cupcakes using a boxed cupcake mix. For the icing I used store bought pre-made white icing that I tinted with Sky Blue Wilton Icing Tint. I iced the entire top of each cupcake, then sprinkled brown sugar on the other half, and added a little paper umbrella to the top. I hadn't really planned on making a cake to go with the cupcakes but at the last minute (i.e. the night before the first party, we had two) Sunshine reminded me that she had wanted a Sunshine cake and let me know that she was expecting it. So I did what any good mom would do I made a Sunshine cake. This is unbelievable! I am actually sitting here on a Friday afternoon planning out my menu for the next week. Usually late Sunday or on Monday afternoon I am trying to pound out my menu for the week but not this week. I won't post this until Monday but none the less I am doing it on Friday! The main reason being that we live in a rural town and we are going shopping in the "big city" tommorow so I want to get whatever I need then where I can get it cheaper than our local grocery store. For Sunshine's luau party invitations I needed something inexpensive, and easy. She wanted to hand out handmade invitations so I started searching Google for ideas. I couldn't find anything that I liked, and finally had a few thoughts in mind when I headed out to Michaels. Instead of going with what I planned I found these Rick Rack Cards marked down to $1.99 at Michaels. 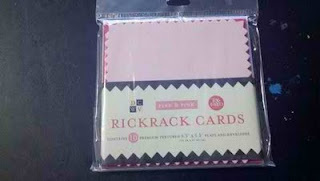 When I got the cards home we glued the dark pink square and light pink rick rack edged square together. We then typed out the pertinent party information on the computer, and printed it out on white card stock. Which we glued in the center of the light pink square. It looked a little plain so we used my Cricut to cut out a few flowers using various shades of pink cardstock. We glued a flower in each of the four corners of the card. We also glude a few of the flower cutouts to the envelope for a little pizazz. Have you heard about the Holiday Grand Plan from Organized Christmas? I hadn't heard of it before this year, I guess I am just a little behind, but it is a week by week plan beginning the week of August 28th and leading all the way up until Christmas. Each week you will focus on a different room/area of your house so that it will be ready for company over the holidays. The plan also tackles other holiday related tasks such as a Christmas Card list, your gift list, decorating, Chrismas baking, holiday menus, and much, much more! I must say for someone as unorganized as me this is wonderful! This week, which is the first week, is the week that you set up your notebook and work on your front porch. 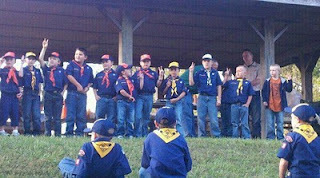 I will be back later this week to post what I did for the week.